Where is the line between precise genius and pretentious schmuck? My gues is it was very close to Stanley Kubrick, whose meticulous and exasperating filmmaking style resulted in some of the greatest films ever made (Dr. Strangelove, A Clockwork Orange) and some of the most boring, over-indulgent movies as well (Barry Lyndon, Eyes Wide Shut.) However, his most studied work is his least-easily defined, which would include space freak-out 2001: A Space Odyssey and Stephen King adaptation The Shining. The Shining, in particular, with its small cast, single location and lingering, surreal scenes, is quite open for analysis, which has encouraged the more...imaginative...among us to come up with some rather unique theories as to what's happening at the Overlook Hotel. Their thoughts are presented without comment in Room 237, director Rodney Ascher's documentary, featuring audio interviews with five theorists who go unidentified outside of their names. Their explanations are heard as examples from the film (along with a host of other sources) play, creating a visual essay about the supposedly hidden themes in the movie. It's an entirely one-sided affair, as there's no rebuttal to these ideas, which are presented individually at first, before swirling together to explore more specific topics in the film. The thing is, most of these theories, from the movie making veiled references to the genocide of the Native Americans and the Holocaust, to the presence of subliminal messaging and clues to the faking of the Apollo moon landing, are a bit out there. Though Kubrick was a perfectionist, he was certainly not infallible, so not every pixel requires an all-important value to be assigned to it. But that certainly will not stop these devotees. The great thing about the way these ideas are presented is the way they become more than just observations about the film but evidence of the extremes of obsession. 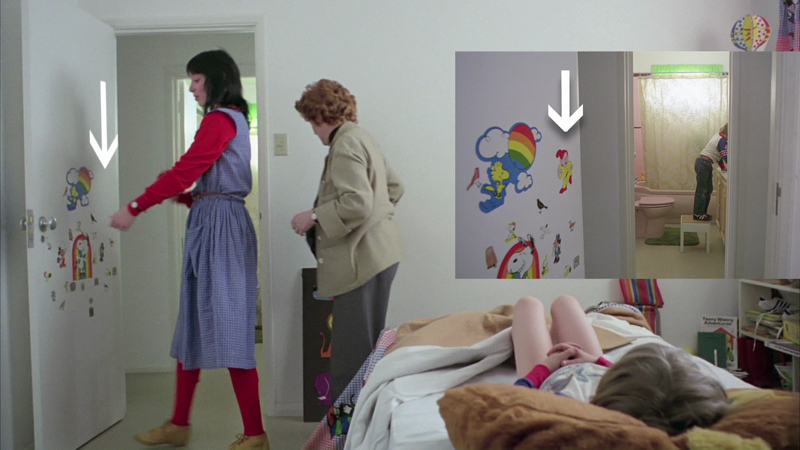 The people sharing their visions of the hidden side of The Shining often have personal stories related to their ideas, and they tend to ignore the fact that their theories don't really play out over the course of the film. For instance, the idea that the film is a treatise on the Native American slaughter isn't explored much further than the presence of some cans of baking powder, a reference to Indian burial ground and the Outlook's Indian-inspired decor (which is hardly unusual for Colorado.) Sure the burial ground is right there in the dialogue, but Native American patterns are everywhere in the Western United States, so it's specious reasoning to say they go together to explain the film, especially when there's not much else to support the idea. It doesn't get much more obsessive than when Kubrick's own intentions are tossed out as essentially meaningless in deference to their own points of view. If you're going to claim that every little detail was placed precisely by Kubrick as clues to a greater meaning for the film, you can't then say his intentions aren't as important as the audience's perception. This angle, which is explored while looking at different ways to watch the film (in very physical terms) and which has definite meaning thanks to the modern remix culture and muti-platform film delivery, isn't delved into nearly deep enough though. By leaving the subjects on their own, with an occasional visual clue that maybe the director doesn't quite buy a theory, Ascher lets the subjects hang themselves, as they often refer to ideas that are essentially meaningless. 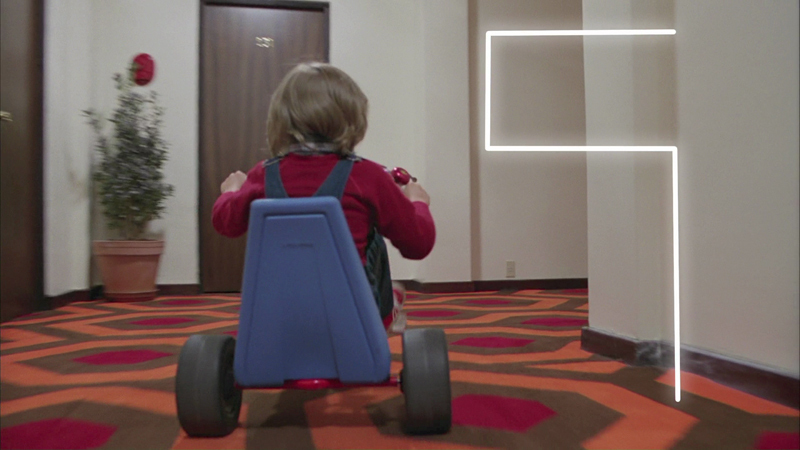 Even if Kubrick, who was as obsessive about details as the subjects are about The Shining, placed all these little clues and ideas into the film, like the chair that goes missing between cuts or the numerology the subjects find all over the place, what does it matter? That's the thing about all these theories: outside of the Apollo moon landing one, which would be a rather massive matter, these ideas don't change much about how one would view the film. They are just interesting little urban legends, like watching The Wizard of Oz while listening to Dark Side of the Moon. That doesn't take away from the quality of Ascher's ability as an essayist, but much of what's here are amusing postcards from the edge; mostly-crackpot ideas best left for a film-studies class or a room full of stoners to pore over. This film arrives on a Blu-Ray disc in a BR-sized digipak in a die-cut slipcase that plays up the legal disclaimer that's synonymous with this film. The disc features a static menu, offering the option to watch the film, select chapters, adjust languages and check out the extras. Audio options include English 5.1 DTS-HD Master Audio and 2.0 PCM tracks, while English SDH and Spanish subtitles are available. The 1080p, AVC-encoded transfer here delivers a mix of quality thanks to the film's mish-mash of sources, though the clips from The Shining are impressively clean, bright and detailed, likely lifted right from the film's Blu-Ray presentation. The rest of the equation, which includes a mix of Kubrick films and a variety of other movies used to illustrate what is said by the subjects, can range from picture-perfect visuals to muddy, pixelated images, but it all moves so quickly you won't have time to linger on anything but the slow-motion, frame-by-frame progressions, which suffer from the effects of such a presentation. Nothing problematic about the transfer seems to have been introduced by IFC, with some of the outdoor scenes from The Shining looking simply tremendous. For a film that's almost entirely about voices (despite the intrinsic supplemental value of the imagery), the thing about the DTS-HD Master Audio 5.1 track that strikes you like an axe to the heart is the film's incredible score, which pays homage to everything great about the music in The Shining (along with other Kubrick films, as well as other movies from the same era.) Utilizing the surround field to move the music around you to excellent effect, the track is less effective with the somewhat thin voices of the subjects, though you won't have problems making out what anyone says. A score-only track would have been quite the experience. 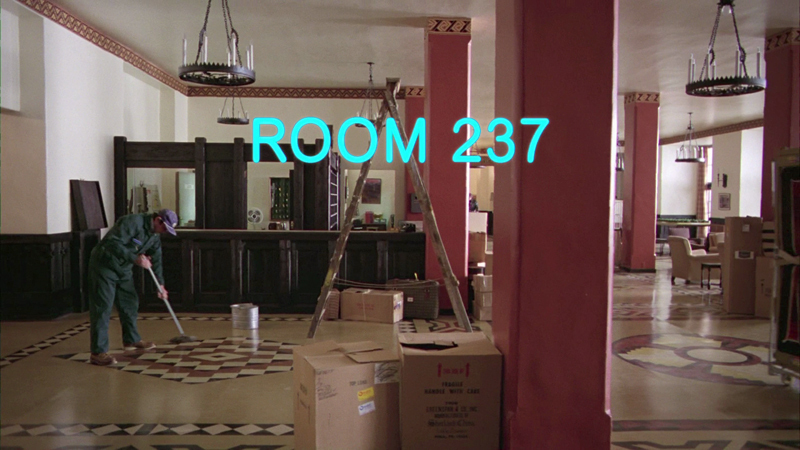 Kevin McLeod, who has extensive online essays about The Shining under the name "mstrmnd," refused to be a part of Room 237, thanks to misgivings about being lumped in with the other participants. However, now he's sat down to provide an audio commentary, where he's free to espouse his thoughts on the film at length, and occasionally in sync with what's on-screen, including his "two of everything" concept, which actually works exceedingly well. Sometimes he comes off like a film professor, but for the most part his ideas are sound and well-presented. He does drop out about 10 minutes before the movie ends, but that creates the uncommon opportunity for you to hear the score during the end of the film. There's more focus on that score in "The Making of the Music" (3:28) which offers an excellent music video that shows the work (including some cat labor) that went into crafting the film's score, including the unique range of instruments that were used to create the movie's haunting music. A fun piece all around. The 50:19 "Secrets of The Shining: Live from the First Annual Stanley Film Festival" is a panel featuring Ascher, director Mick Garris (The Shining miniseries), Jay Weidner (a subject in Room 237) and Kubrick's long-time friend Leon Vitali, with Badass Digest's Devin Faraci acting as host. God bless Vitali for deflating the theories, right to the face of one of the theorists, in this fun, informative featurette, which is a boiled-down examination of the ideas in the film, only with a few authoritative sources chiming in. 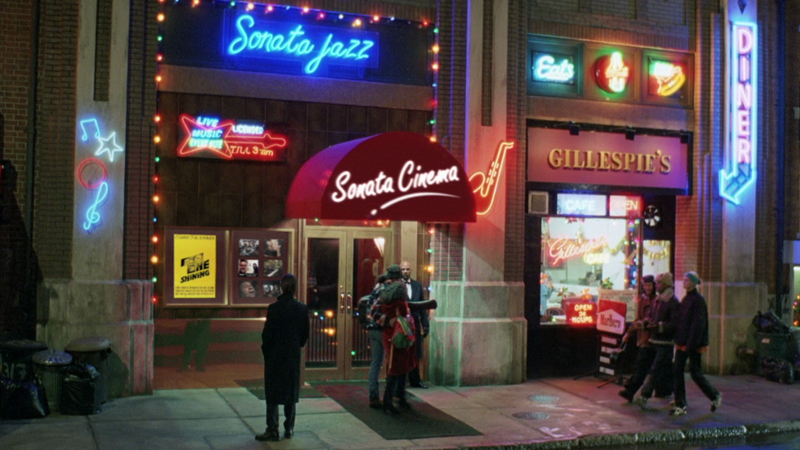 A selection of 11 deleted scenes are presented (which can be played in one 23:51 reel.) These scenes are just audio with the video of a Final Cut Pro screen playing the clip, so it's one of the odder sets of deleted scenes, but there are some interesting moments, including discussion of the difference between the International and American cuts of the film and one subject sharing Kubrick's concrete denial of part of his theory. I will admit, it's a bit hard to watch these without visuals. One of the coolest extras is "Mondo Poster Design Discussion with Aled Lewis" (3:01) in which the artist explains all the hidden symbolism in the ingenious poster he designed for Mondo's poster of the film, incorporating all the film's theories into a gorgeous image. Wrapping things up are several versions of the film's trailer, which is eyecatching and brilliantly attuned to the movie. If you're looking for deeper meaning in The Shining, this film will only offer some first steps down paths you can travel further upon. However, if you want to meet some heavily dedicated film theorists and soak in their crazy, this is the place to do it. The disc looks and sounds very nice and offers up some really interesting extras that build and expand on the film. Fans of Kubrick and/or his films must see it as should anyone else who's passed a gaggle of cinephiles, shaking your head at their pretentiousness.